Another new teacher story and comic has arrived! (Thank you Mr. D.) Read to see how a creative lesson can turn into a interrogation session. Share your teacher story today to become a part of the next 180Dayz book and earn a free 180Dayz calendar! https://180dayz.com/180dayz-new-teacher-book/ Thanks!!!! “I was given the privilege to pilot a new forensics science course at my school. There wasn’t much in terms of materials or curriculum supplied, so it was left mostly up to my own devices to come up with the units and lessons. One of my goals was to make the course as relevant as possible to maximize student interest, so I would try to relate the material we covered to real life investigations. In one particular lesson we were covering the 12 points system used by evidence investigators for handwriting identification. Part of this lesson was discussing the Zodiac serial killer case and how this method was employed to help figure out whom the killer was. 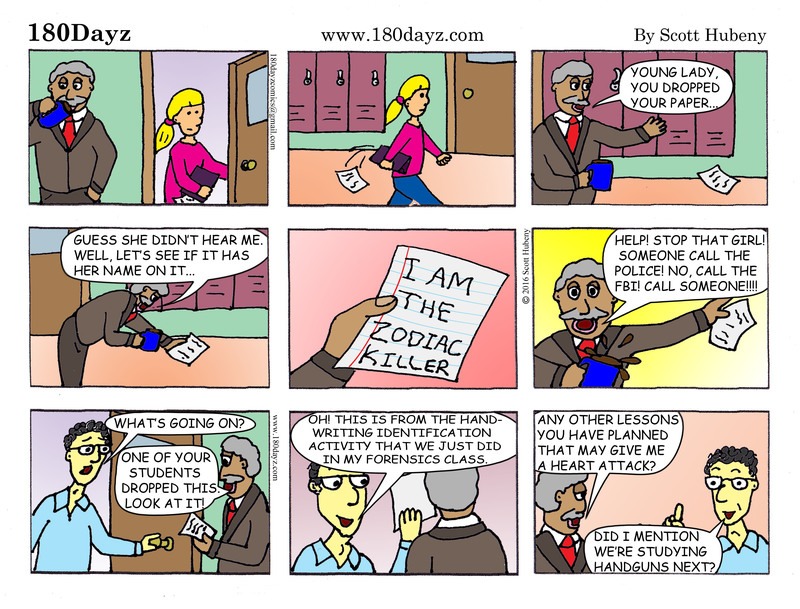 To engage students in the lesson and get them discussing the content with one another, I employed an activity where students would write on a paper “I am the Zodiac killer,” and then I would exchange the papers with other students and have them use the method of handwriting analysis we just learned to try to figure out who the letter belonged to. During this lesson one of my students asked to use the bathroom. I wrote her a pass and sent her on her way. Apparently she had unwittingly left the room with her “I am the Zodiac killer” letter. In the process of transitioning to the bathroom the letter must have fallen from her notebook onto the hallway floor where of all people, one of our school psychologist happen to be walking by. She picked up the letter and immediately sprinted to the school police, whom promptly informed the principle. Needless to say, a few moments later this young lady found herself in the school police office, being interrogated by nearly the entire administrative staff! After some explaining she was returned to class accompanied by the principal. We shared a laugh about it and he asked me if I had any other surprises for him. He laughed even more when I told him that next week we were going to be studying about handguns in my forensics class (of course just in theory, no actual guns in the building). Lesson learned that day: If you planning on teaching or doing an activity in your class that if seen out of context could be taken the wrong way, be sure to inform others of what you’re planning (especially your principal! ).